The Lodges of Ondessonk and Tekakwitha Celebrate 60 Years with a Renewed Interest in Teaching and Demonstrating What Matters Most. Today’s camp directors are well aware of the changing needs of youth programming and the increasing attention being given to social justice issues. As a result, summer camps find themselves consistently challenged to engage in a process of self-reflection which often calls for the re-evaluation of both the content and delivery of programs that may be steeped in long- standing camp tradition. In the instance of an “Indian” event day or associated indigenous- inspired curricula, repetitive programming based solely on maintaining a camp tradition and devoid of any process toward reflective practice can turn a well-intentioned camp activity into fertile ground for naive acts of cultural appropriation and the reinforcement of stereotypes (Shore, 2015). This awareness of cultural appropriation, and a growing discomfort with performing another cultures’ spiritual practices, paired with the knowledge that the true meaning of Lodge had been somewhat lost over time, was the impetus that led Lodge officials and summer staff to re- evaluate long standing Lodge ceremony practices during the summer of 2017. Camp Ondessonk is not alone in re-evaluating its tradition of incorporating Native American practices into its camp culture. The National Council of YMCA changed the Indian Guides and Indian Princesses program in 2001 to be more respectful of Native American culture. The program was renamed Adventure Guides and Princesses (Webb, S. 2016). In an article written for the American Camp Association by Bonnie Dunn and Denise Frebertshauser, the authors encourage camps to examine their program for traces of cultural appropriation. Deciding to thoughtfully examine the Lodge ceremony was the beginning of a year-long collaboration among the Board of Directors Program Committee, Lodge officials and other interested parties. After taking this opportunity to evaluate the program holistically, the resulting consensus was that the Lodge Ceremony was falling short in two very fundamental way: First, the ceremony failed to explain that Lodge is a service organization whose members try to lead their lives by the values of Camp Ondessonk. And secondly, adequate time was not being given to teaching campers about their Units namesakes, the North American Martyrs. The charge was to make Lodge relevant in 2018 while still honoring 60 years of tradition. The goal is to make the new Lodge ceremony an entertaining, educational and engaging program that leaves all of Camp with a clear and positive impression of Lodge as a group of exemplary individuals who demonstrate by example the values of respect and love for God, respect and love for the earth, and respect and love for each other. Council, as an activity area, will now give campers the opportunity to learn more about their Units’ namesakes, the North American Martyrs. 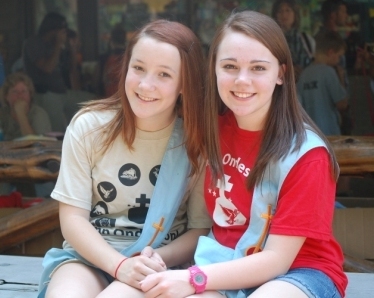 In this setting, campers can have an interactive dialogue with staff while they learn more about the history of Camp Ondessonk and celebrate the Catholic faith. Traditions, while maintained in the present have their origins in the past. They are all about inherited ways of thinking and acting. If we don’t take the time to evaluate our traditions, we begin doing things simply because we’ve always done them that way (Carolyn McDowall 2014). Change can be difficult, the collaborators that are stewarding this shift ask for your patience and grace as the program evolves. This is an opportunity to create compelling programs that meet the goal to teach the entire Camp Ondessonk family what matters most.